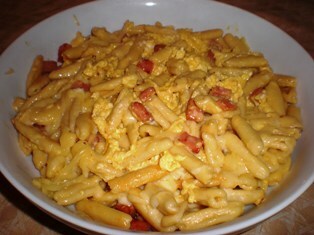 A rich and creamy pasta with crisp ham and an egg and Fontina cheese sauce. 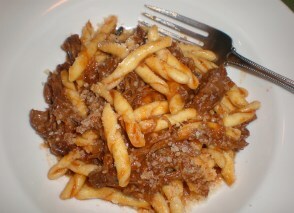 A hearty pasta dish with cubes of lamb and vegetables from Abruzzo. 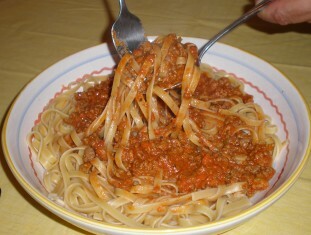 Ragu Bolognese is a specialty ragu from the Emilia-Romagna region of Italy. 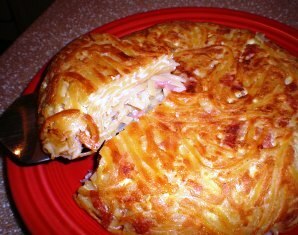 Spaghetti pie is made in a skillet with cooked spaghetti, eggs, salami, prosciutto, and provolone. 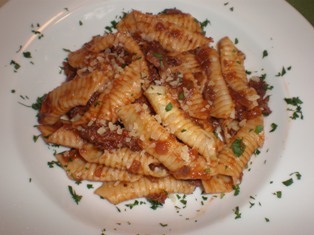 A ragu of ground pork with a small amount of cinnamon and chocolate that adds a subtle richness to the sauce. 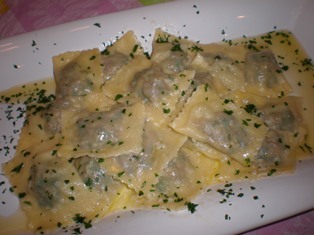 Straw and hay refers to the combination of egg pasta and spinach pasta that are used. 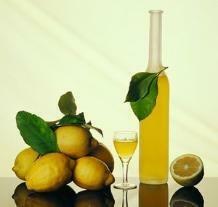 This sauce may also be served with penne, rigatoni, cavatelli, or any similar size pasta. 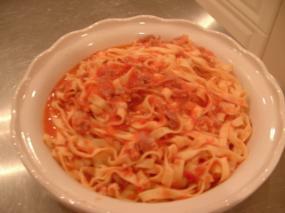 Tagliatelle are long, flat ribbons, similar in shape to fettuccine, but typically about one-quarter inch wide. Combines the flavors of butternut squash, Italian sausage, and sage for a simple and delicious dinner. 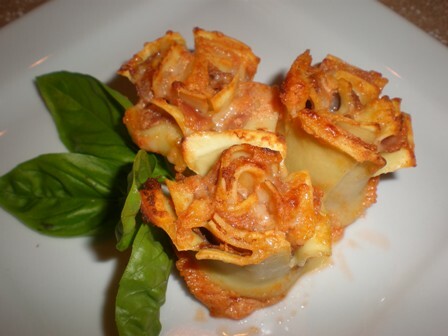 The filling for this cannelloni is made with chicken, prosciutto and mortadella. 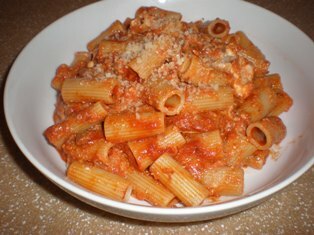 From Puglia, this recipe features a rich and spicy meat sauce served with cavatelli. 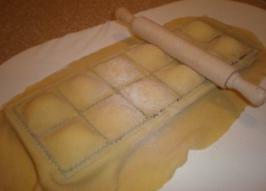 Similar to ravioli, agnolotti are fresh pasta squares filled with meat from the Piedmont region of Italy. 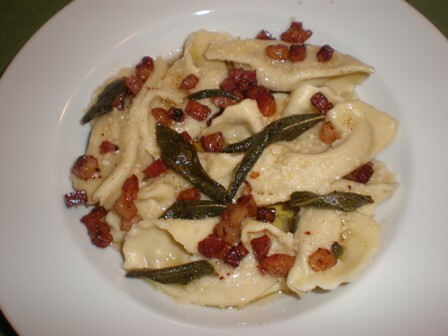 A specialty of the Lazio region, this dish is traditionally made with guanciale, cured pig's cheek, but pancetta is often substituted. 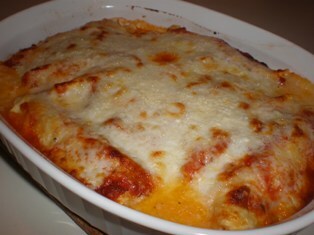 A variety of lasagna recipes made with ground beef, sausage, chicken or turkey. 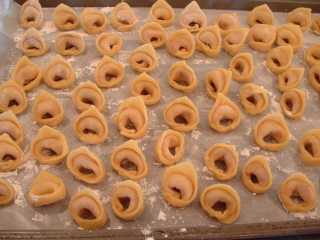 Casoncelli from Lombardy are made with fresh pasta dough that envelopes a slightly sweet meat filling and are typically served with melted butter flavored with pancetta and sage leaves. 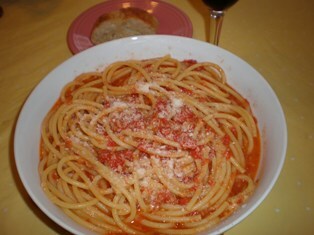 A traditional dish from Calabria featuring a rich sausage and tomato sauce. 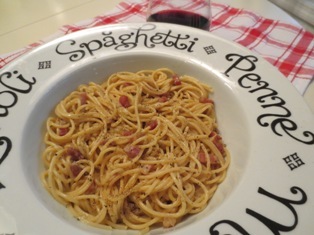 A traditional dish from Lazio, real carbonara contains no cream ... it's simply eggs, crispy guanciale or pancetta, Pecorino Romano, and black pepper. There are lots of new types of pasta available at the supermarkets these days. 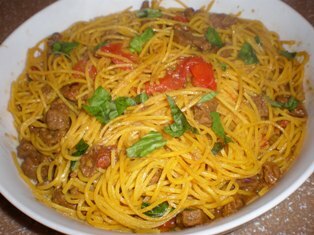 Many of them give pasta lovers with gluten sensitivity plenty of options. Choosing a gluten-free pasta boils down to personal taste preference. 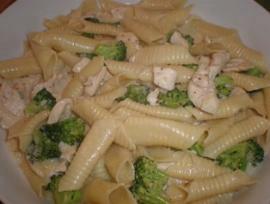 Rice pasta, usually made with brown rice, is one of the most popular choices thanks to its mild flavor. 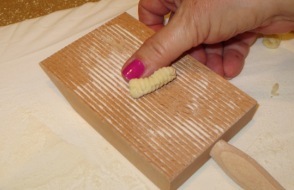 Corn pasta has a bright yellow color and rough texture that is good for holding sauces. The problem with corn pasta is that it can have a distinctive corn flavor. Quinoa pasta sounds like it would be the best nutritional choice. However, a lot of food manufacturers, knowing that quinoa is now very popular, label their packages as quinoa pasta when the contents actually contain mostly rice or corn and just a little quinoa. So be sure to check the labels to be sure that the only ingredient is quinoa. The worst thing you can do to gluten-free pasta is to overcook it. 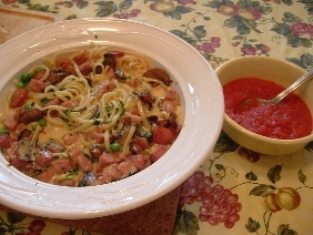 Overcooking causes the pasta to get mushy and slimy. Read the cooking directions on the package but test the pasta often. As soon as the pasta is tender, drain it and add it to the sauce. 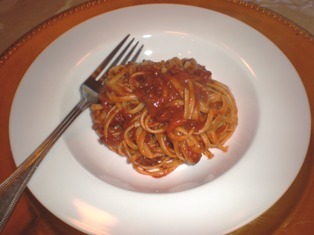 If you're trying gluten-free pasta for the first time, serve it with a hearty sauce, such as a meat ragu or Alfredo sauce. With this type of sauce you won't notice much of a difference from regular wheat pasta. 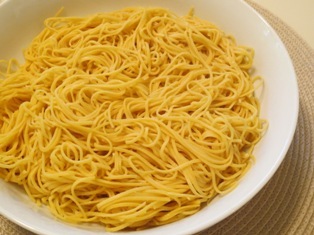 Don't serve rice pasta cold or keep it for leftovers because it will harden when cooled, just like cold rice, and the pasta will become stiff and taste like cardboard. 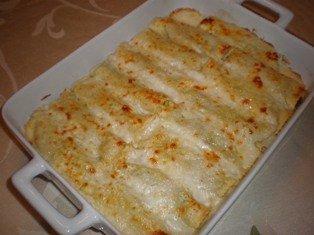 When a recipe calls for grated cheese, you might not always know how big a block you should buy. The texture of a cheese makes all the difference, but as a general rule, three to four ounces yields one cup grated. 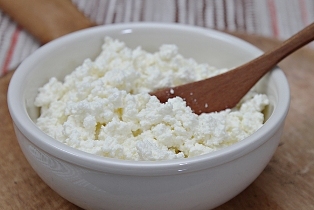 To measure cheese, put it in a measuring cup and tap it against the counter; don't pack it firmly in the cup. 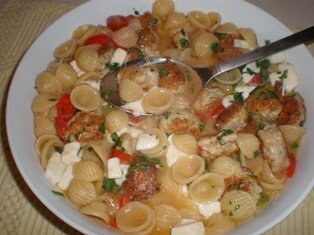 In this recipe the sausage, pasta and sauce are all cooked together in one skillet for a quick and easy meal. 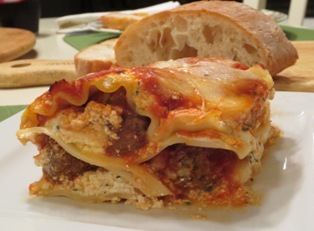 but are also perfect to transform a regular dinner into a special family pasta night.